Shhhh. Don’t let anyone know I am typing on Grandma’s computer. 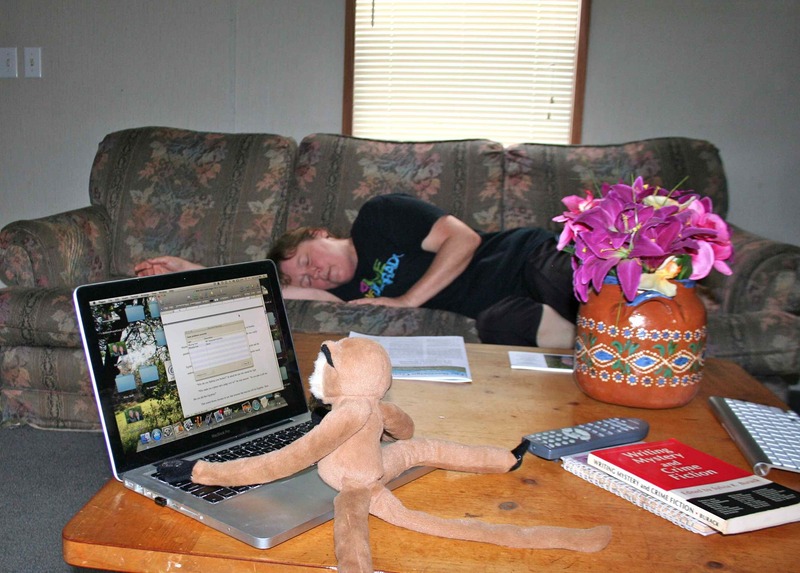 Monkeys aren’t supposed to write blogs — especially not toy monkeys. Grandma was supposed to write my story, but I gave up on her! She SAID she was going to tell you all about me, but she kept on doing boring stuff like packing and cleaning. Then she went on a long trip — and I don’t think she is EVER going to write my story. I will have to do it myself! I sneaked in while she dozing on the couch and if we are very quiet and don’t wake her up, I will tell you my adventures. They are pretty exciting already! My life started in a factory in China. I’m a stuffed Gibbon monkey with l-o-n-g arms and legs. They shipped me to Oklahoma where I found myself in the gift shop of the zoo. B-o-r-i-n-g! It would be interesting to see the real animals in the zoo, but all I did was hang around the store with dozens of other stuffed toys. One day a lady came into the shop with four kids. They were very busy looking at all the interesting things in the store, but a little girl with long brown hair and big brown eyes came over and looked right at me. “I like this one, Grandma” said. She pointed at me — or was she pointing at the silly-looking wolf behind me? I did hope she would pick me! The lady she called “Grandma” reached over and (yes!) she picked me up. “Your cousin Izzi likes this one. What do you think Henry?” Grandma asked. A blond-haired boy with bright blue eyes looked me over. The biggest boy, who had brown hair and blue eyes, shrugged. “Okay, I guess,” he said. I was s-o-o-o glad! I wondered where I would live and who would be my new owner. Izzi? Henry? Justin? Jeremiah? I was in for a big surprise! “Grandpa, look what Grandma bought!” Henry yelled as he ran up to a kind-looking man waiting on a bench outside. Grandma took me out of the sack (whew! it was hot in there!) and showed me off. “Let’s call him Donkey Kong,” said Henry. So I became Linkee. And let me tell you, my adventures have been… oh, oh. Grandma is waking up. I’ll have to tell you about how I fell off a mountain next time I can get on the computer. ← Goodbye Thailand! The Last Busy Week.